Two workers were blown to bits in a powerful explosion in the boiler of DVS Steel and Alloy factory in Vijay Nagar Industrial Area, Ghaziabad in the morning today. Another half a dozen workers were seriously injured in the blast, one of them is in a serious condition. In the wake of the October 29 serial bomb blasts in the Capital the police have made unprecedented security arrangements for the forthcoming India International Trade Fair. Taking cognisance of the fact that 58 years after Independence, children in the country are yet to enjoy the rights guaranteed to them by the Constitution, Child Relief and You is organising a ‘National Consultation on the Rights of the Child’. The Haryana government has approved a proposal of the Haryana Urban Development Authority to set up an additional circle to the engineering wing of HUDA, Gurgaon Range, for development works to be carried out from the pool of External Development Charge. Gurgaon has improved its roadways services and come second in performance in the state. The first, of course, is Chandigarh. Preference to learn a foreign tongue to cash in on the opportunities that come thereby has led to a spurt in the teaching and learning of foreign languages in schools. Of the 29 languages that are offered by the Central Board of Secondary Education besides Hindi and English at Secondary and Senior Secondary levels, nine are foreign languages. Sri Ganapathi Sachchidananda Swamiji of Mysore, known for his mystical powers to heal people through spiritual music, mesmerised devotees and guests in a music concert on ‘Meditation and Healing,’ at Siri Fort Auditorium on Saturday here in the Capital. A disciplinary action has been recommended by the four-member committee led by the Additional Deputy Commissioner against a doctor, a nurse and two other employees of the Bhadshah Khan Civil Hospital here in connection with the delivery of a baby outside the causality room of the hospital, a couple of days. The health authorities have meanwhile transferred them to other places for their alleged negligence in treating the patient. The State Government has decided to make all information pertaining to the district consumer forums available on the Internet. In the wake of the booming Indian economy attracting foreign investors, a two-day conference commenced here to discuss how international arbitration could be made an effective tool to resolve disputes on contractual liabilities. While the police have failed to rescue seven out of nine minor girls who had been missing from Nithari in Sector-31 Noida four months ago, three more girls have reportedly gone missing from the city. In a significant move, the Delhi Police have decided to install CCTVs in major market places for better surveillance in the aftermath of October 29 triple blasts in the national Capital. The triple blasts in the Capital had left 60 dead and more than 200 seriously injured. The thieves decamped with valuables worth Rs 15 lakh and a revolver from the house of an Army colonel in Sector-29 in broad daylight. Col. Mahavir Singh was out on duty while his wife had gone out for shopping when the criminals struck at their house No. 366 in Sector-29 in Arun Vihar, Noida on Friday. The Delhi Government is making all arrangements to ensure smooth transit of Haj pilgrims from north India through the national Capital. Factory manager and owners are absconding. According to police, two employees Ajay Kumar,18, and Mithlesh, both of Bihar, were killed in the blast while Suresh, Vinode Pappu, Gopal and Chandram, have been admitted to Ganesh Hospital, Ghaziabad. Suresh is serious. He was operated upon in the morning. Apart from injuries some bits of steel had got embedded in his body. They had been removed from his body, but he was still unconscious. Police Circle Officer Dr Dharam Vir said blast had occurred in the iron-smelting furnace of the factory. The accident took place between 5 and 5.30 this morning when Ajay, Mithlesh and Suresh were working near the furnace. About three tonnes of scrap of steel was shoved into the furnace and the blast was so powerful that the furnace cover and shed were blown 200 mt away. A fire caused by the blast had everyone crying and running here and there. Vijay Nagar police came at 5.45 a.m. and rushed some unconscious workers to hospital, S.O. Anil Somaniya said. 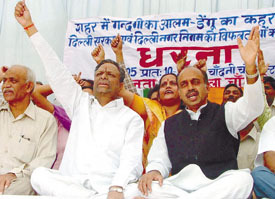 Ajay and Mithlesh were declared brought dead by doctors. The owners of the factory could not be traced In spite of efforts by the police. Many workers are said to be missing after the explosion. It may be recalled that two years ago also, a few powerful blasts had taken place in some steel factories in Sahibabad in which 11 workers were killed. It seems the factory owners and the authorities have not learnt any lesson from the past tragedies. Scrap steel with ammunition shells and live cartridges etc is still imported and shoved in for smelting into furnaces, which causes explosions and loss of human lives. In the wake of the October 29 serial bomb blasts in the Capital the police have made unprecedented security arrangements for the forthcoming India International Trade Fair. Metal detectors, X-ray machines, mine-detectors, binoculars and night vision devices, watch towers and CCTVs would be used. 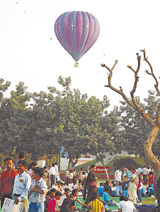 Moreover, the Delhi Police has prepared Traffic Management Plan, which they claimed to be much better than for the India International Trade Fair in 2004. The security arrangements have been in place from November 8, when material for setting up exhibition halls and stalls started trickling in and would continue till November 27, said Deputy Commissioner of Police Anita Roy. “We want to leave nothing to chance,” DCP Roy said. “No one is being allowed into the Pragati Maidan without proper checks and all the exhibition material is being scanned,” Roy said. Besides 500 men of the New Delhi district and three reserve companies, Army and Intelligence Bureau personnel would assist the Delhi Police, which would also deploy officials of the Crime Branch and Bomb Disposal Unit. They would be backed by 450 Indian Trade Promotion Organisation staff. A special ‘police station’ has been created under Additional Commissioner of Police Rajiv Ranjan to ensure there is no law and order problem at the IITF venue, where more than 40 lakh people are expected to visit during the 14 days between November 14 and 27. Student squads and plain-clothed policemen would comb the complex hunting for eve teasers and shoplifters. Extra precautions have also been taken in printing tickets to eliminate chances for use of duplicate or bogus ones. Talking about the traffic arrangements, Joint Commissioner of Police (Traffic) Qamar Ahmed said over 600 traffic personnel would see to it that there was no conflict between vehicles and pedestrians. Arrangements would be made to see that people stayed on footpaths and vehicles were not parked or waiting around the IITF complex. Vehicles will not be allowed to even halt on the road around the fair ground, said JCP Ahmed. The plan is also to dissuade people from using their vehicles and instead use public transport with tie-ups with DTC, Delhi Metro and the Railways, where tickets would be sold and free shuttle services available. Besides, 13 parking lots with park-and-ride facilities away from the venue have been planned. 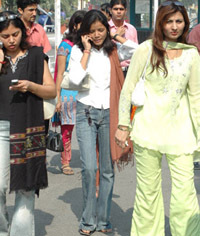 Deputy Commissioner Roy said special teams in plain clothes will be present inside the Pragati Maidan to check eve-teasing and theft. The traffic police has arranged parking facilities at a few places around the fair ground and at nearby stadia from where free shuttle rides will be available for visitors. Special lights have put up at all parking places and security personnel will be deployed till the last vehicles leave, the DCP said. To keep a check on the menace of duplicate tickets, special hologrammed ones will be issued this year, she said. JCP Ahmed encouraged visitors to use public transport to reach the venue as parking space for only about 6,000 vehicles will be available. “To discourage use of private vehicles, the parking rates have been kept on the higher side at slots near the venue. It will be Rs 50 for cars on normal days and Rs 75 on holidays while for buses this will be Rs 100 and Rs 150 respectively,” he said. The Delhi Metro will also have a special role to play in decongesting the roads to Pragati Maidan as free shuttles will be available to it from the Central Secretariat station. Tickets will be available at some Metro stations, banks and special Delhi Transport Corporation buses. Taking cognisance of the fact that 58 years after Independence, children in the country are yet to enjoy the rights guaranteed to them by the Constitution, Child Relief and You (CRY) is organising a ‘National Consultation on the Rights of the Child’. The national consultation is an attempt to look at child rights holistically rather than in segments. Over 200 people from across the country working on child rights will join a team of experts for the event scheduled between November 13 and 15 at Jamia Hamdard University here. The relevance of this event, it was pointed out, is that even 58 years after Independence, Indian children are yet to enjoy the rights granted to them by the Constitution. Basic rights to quality education, good health and a safe nurturing environment are a distant dream for millions of children. This consultation, it was further pointed out, is an attempt at engaging with different segments of society, NGOs, activists, political leaders, academics, judiciary, media, health professionals and the corporate sector, towards jointly ensuring a more just world for children. The multi-disciplinary consultation aims to create a common understanding of the rights that every child should be guaranteed irrespective of class, caste, gender or religion. It will focus on how child rights issues and justice norms are perceived and negotiated by groups and individuals in different contexts such as: living conditions of children outside parental care; rights of children with special needs; gender issues; community support systems; public services; privatisation and governance; juvenile justice strategies and their impact. The Haryana government has approved a proposal of the Haryana Urban Development Authority to set up an additional circle to the engineering wing of HUDA, Gurgaon Range, for development works to be carried out from the pool of External Development Charge (EDC). The proposal was routed through the office of the Administrator, HUDA Gurgaon Range, to its headquarters which appreciated it and sent it to the state government. A case was made out in the proposal for a separate circle to be headed by an officer of the rank of Superintending Engineer in view of HUDA’s plan to accelerate the development works in Gurgaon. According to the Administrator, HUDA, Gurgaon, Mr S.P.Gupta, about Rs 1,600 crore lying with the body collected as EDC is to be spent. EDC is being collected by HUDA since 1989 from the buyers of plots as well the private colonisers to cope with the pressure to provide infrastructure in Gurgaon in the wake of its rapid growth. While a portion of the EDC has been spent, the major chunk is lying with HUFA at its disposal. A source in the Haryana government said that the proposed engineering circle was likely to be christened “Circle, EDC” in a bid to emphasise the conceptual stress behind its creation. HUDA, Gurgaon Range, has one engineering Circle. Apart from Gurgaon, Rewari, Mahendragarh and the newly created district of Mewat fall in the jurisdiction of the Range and the existing Circle. With rapid expansion and development, the existing infrastructure of the engineering wing of HUDA has been found. At least three executive engineers will be placed in the new circle. As per the indications available, the new arrangement will be in place soon as the government is firm to embark on the construction works of the development projects in a major way from EDC fund before the close of the present year. Gurgaon has improved its roadways services and come second in performance in the state. The first, of course, is Chandigarh. Deputy Commissioner R.P.Bhardwaj informed the media persons in the Roadways office here on Friday that though Gurgaon roadways had suffered a loss of Rs 23.52 lakh in October, it earned a revenue of Rs 15.02 per km, second in the state only after the Chandigarh depot which earned a revenue of Rs 15.99 per km. Bhiwani district suffered the highest loss of Rs 98.16 lakh in the state with an earning of Rs 10.22 per km in October. As per the official records of the Haryana roadways, Chandigarh is the only depot, out of the 20 district-level depots in the state, which has earned a profit of Rs 1.54 lakh in October. The remaining 19 depots had suffered losses. Rohtak, Hisar and Karnal suffered a huge loss of Rs 78.66 lakh, Rs 76.54 lakh and Rs 80.01 lakh with the earning of Rs 11.54, 11.47 and 12.22 per km respectively in the corresponding month. Rewari suffered a loss of Rs 24.92 lakh and earned Rs 13.62 per km; Sirsa suffered a loss of Rs 66.19 lakh and earned Rs 11.05 per km; Faridabad bore a loss of Rs 52.16 lakh and earned Rs 13.25 per km; Jhajjar Rs 46.52 lakh and Rs 12.21; and Fatehabad with Rs 73.79 lakh loss and earning with Rs 11.02 per km. In the corresponding month of October 2005, Narnaul suffered a loss of Rs 25.98 lakh with earning of Rs 12.59 per km; Delhi depot Rs 8.03 lakh with Rs 14.77; Kurukshetra Rs 65.68 lakh and Rs 12.27; Panipat Rs 28.22 and Rs 14.26; and Kaithal district suffered a loss of Rs 66.82 lakh with an earning of Rs 11.46 per km. Yamuna Nagar suffered a loss of Rs 48.97 lakh with an earning of Rs 13.36 per km; Sonepat Rs 53.34 lakh and Rs 13.97; Ambala Rs 58.78 lakh and Rs 14.00; and Jind district suffered a loss of Rs 68.44 lakh with an earning of Rs 11.77 per km. General Manager of Gurgaon Roadways, Mr Jaibir Singh Arya said that a proposal of Rs 68 lakh for improving the services of Gurgaon depot had been sent for approval to the head office. Out of which, Rs 22 lakh had already been sanctioned. Various services for Gurgaon bus stand would be upgraded soon, claimed Mr Arya. DC R.P.Bhardwaj informed that another three bus stands at Sector 29, Rajiv Chowk and Punchgaon each had already been approved. The bus stand at Sector 29 would be of international standard. Global tender would be invited for this 7.5 acre bus stand with all modern facilities. And with the barriers of language fast melting, the number of foreign languages that have bee included in the school curriculum is also increasing. Spoilt for choice, students can now look forwards to learning Japanese alongside French and German. With the governments and Japan having signed a MoU, the CBSE is now offering the teaching of Japanese in schools. The Board proposes to introduce Japanese language in the school curriculum for its affiliated schools from the academic year 2006-07. The language, which will be introduced at Class VI, will be extended to higher classes progressively. An official of the Board said that the course material for the teaching of the language is being developed by experts and it would be made available to schools before the commencement of the academic session. It was pointed out that teacher training will be carried out by the Japan Foundation in collaboration with the Japanese Embassy in India as per requirement. In a two-hour music concert, which was attended by several important personalities including the Lok Sabha Speaker, Mr Somnath Chatterjee and the Delhi Lt. Governor, Mr B L Joshi, swamiji’s performance was very well received among the guests who were seen glued to their seats till the end of the concert. “The music therapy is combined with Ayurveda, psychology, gemenotherapy and astrology,” says Swamiji. 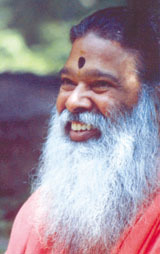 Swamiji’s music is devotional and used for spiritual energy transmission. He sings self-composed bhajans in Sanskrit, Hindi, Telugu, Kannada and English and plays Ayurvedic healing ragas on an electronic synthesizer, accompanied by musicians on classical Indian instruments. Devotees in India and around the world claim to have received immense benefit through his concerts, everything from physical healing to spiritual guidance, and great outpourings of divine love. Listening to his ‘Healing and Meditation’ music is a melodical medicine prescribed by Swamiji for all ailments and conditions ranging from coma to cancer and migraine to mental depression. He was born as Satyanarayana on May 26, 1942, in Mekedatu village in Karnataka to a poor couple, Sri Narashima Shastry and Jayalakshmi Mata. His mother was a ‘yogini’ and transferred all her spiritual energy to young Satyanarayana at the time of her samadhi in 1953. Having his headquarters in Mysore, he has established many ashrams and has devotees around the world spreading the message of peace. Swamiji’s greatest contribution to the suffering humanity is healing them through his music. According to him, “music has great influence on the ills of the body and it is considered as the fourth ‘upaveda’, the Gandharvaveda. A disciplinary action has been recommended by the four-member committee led by the Additional Deputy Commissioner (ADC) against a doctor, a nurse and two other employees of the Bhadshah Khan Civil Hospital here in connection with the delivery of a baby outside the causality room of the hospital, a couple of days. The health authorities have meanwhile transferred them to other places for their alleged negligence in treating the patient. The committee had been formed on the orders of the Deputy Commissioner, Mrs G. Anupama, after the family of the victim had demonstrated outside the hospital on Thursday last, demanding action against the staff. They alleged that due to the delay on the part of the doctors and staff, the woman delivered a baby who died soon after. But the post-mortem examination led to the conclusion that the baby was stillborn. The woman identified as Shyamwati and her husband Charan Lal, residents of Bhadkhal village, had reported at the civil hospital around 11 am on Thursday. The woman was in an advanced stage of pregnancy. The woman had to move to the first floor through stairs. Her labour pains became acute and she delivered the baby in verandah. Before she could be rushed any help, it was noticed that the baby had already been dead. This angered her attendants present there, who started raising slogans against the doctors and the staff, and held them responsible for the child’s death. As the matter became serious, senior police and administration officials rushed. The Deputy Commissioner asked the ADC to conduct an enquiry, which found that at least one doctor, a nurse and two employees of the hospital, who had been on duty at that time, had been responsible for this unsavory incident. It was a case of gross negligence, the report says. Though it states that the baby had been stillborn, it has recommended an action against the doctor and other staff. The report has been sent to the Chief Secretary and the top authorities of the health department. It may be recalled that the labour room (delivery room) in this hospital which is the largest civil hospital in Haryana, has been located on the first floor and the women who come for delivery have to climb up to the first floor. The lift provided here hardly remains functional, especially at night, when there is no attendant. This is not the first such case. Two years ago, a woman had delivered in a similar fashion. Another who was allegedly turned away had to deliver the baby in a moving vehicle. The Deputy Commissioner has claimed that strict action would be taken against anyone found guilty of negligence or involved in corrupt practices in hospital. The State Government has decided to make all information pertaining to the district consumer forums available on the Internet. The government has also decided that the consumers courts functioning on rental premises will be allotted land for constructing own buildings and new staff will be appointed in the forums facing staff shortage. Some new benches of consumer courts will be set up to speed up disposal of cases pending before consumer forums. The Chairman of UP Consumer Redressal Commission, Justice Palok Basu, a former judge of the High Court who inspected Noida Consumer Forum yesterday, gave this information. Chairmen of Noida and Ghaziabad Consumer Forums, Ajay Swaroop and B.K. Agarwal were also present on the occasion. Justice Basu said details of all consumer complaints would be made available on the Internet within three months. He disclosed that a plot of land has been allotted near the Collectorate Gautam Budh Nagar for Noida Consumer Forum which is functioning from rented accommodation in the city. The construction of building will soon be started here. The Chairman UP State Consumer Commission said that infrastructural deficiencies and staff shortage will be sorted out soon. The State Government agreed with a number of proposals sent by the State Consumer Commission. New staff will soon be appointed in the consumer forums facing staff paucity, he added. Mr Basu expressed satisfaction at the working of 70 per cent of the District Consumer forums in the state. Some advocates had also met the Chairman of UP Consumer Redressal Commission. The Conference was hosted by the London Court of International Arbitration (LCIA) and attended by legal experts from USA, Europe, Australia and Asian countries. Another brain storming seminar on outsourcing of legal matters to India would be held here from November 18, in which law firms from these countries would participate to deliberate upon forming a world wide alliance to “serve and support” the cross-border needs in legal matters. The LCIA is an independent institution providing comprehensive mechanism in resolution of disputes through arbitration by adopting neutral procedure and venue suitable for the parties. With considerable efforts, police succeeded in tracing two of the nine girls while there is no word about the rest, despite the National Human Rights Commission having summoned senior police officers. While the case of a kidnapped girl from Harola was registered by the police on Friday, a 15-year-old girl from Nithari and another girl from Naya Bans area are also reported to be missing. When Sanjay Kumar Mandal returned from work to his home in Harola, he found his sister missing. He said a neighbour Gulab who used to harass his sister must have abducted his sister, as Gulab is also missing. Second incident happened with Surender Kumar of Nithari. His daughter Rekha (changed name) used to go to a school in the colony. According to Surender Kumar, a worker in a construction company, his sister had set out for her friend Chand’s house in the evening on Thursday, but did not return. Surinder Kumar suspects a CD shop owner Arvind to have eloped with his sister, as he has not been seen after the incident. In the third incident, Malti, a resident of Gali No 1 in Naya Bans, has also gone missing. P. Kumar has reported the matter to the police, but SP City Soumitra Yadav said the police are still investigating. The police have failed so far to trace seven girls out of nine who had gone missing from Nathari in July. “Installation of cameras would definitely help the police in tracing robberies and catching thieves. Moreover, it would help the police to identify the terrorists responsible for the serial blasts,” said a senior police officer. The cameras have already been installed in the Karol Bagh market area, and is planned to be installed in other places such as Paharganj, Sarojini Nagar, Lajpat Nagar, Connaught Place, Pragati Maidan etc. These cameras would be inter-linked and would be connected to a control room from where the police force can keep a close watch on the series of events going on in such congested market places, said police sources. Moreover, such cameras would help in controlling the traffic movement in congested market places. Sources said that as of now, the police have already secured the permission to install 24 CCTVs between Red Fort and Fatehpuri in the walled city. The police officials believe that using new technology would provide an edge to the department in controlling criminal activities in the Capital. When Mrs Alpana, wife of Col. Mahavir Singh, came back along with servant, she found the lock on the main door broken and almirahs in the room were broke open. All the belongings were lying strewn around. Two diamond sets, a revolver, 3 cameras, mobile phone, 18 gold bangles, rings, 80 rare coins, and many other valuables are missing, Col. Mahavir Singh said. He said the valuables were worth Rs 15 lakh roughly. Incidentally, Sector-29 and entire Arun Vihar comprising Sectors-28, 29, 30, 37 are considered posh areas of Noida. The Delhi Government is making all arrangements to ensure smooth transit of Haj pilgrims from north India through the national Capital. At a high-level meeting, the Delhi Development Minister, Mr R. K. Chauhan, reviewed the arrangements being made at the historic Ram Lila ground in Old Delhi. The Chairman of Delhi State Haj Committee, Mr A. S. Salmani, representatives from the Delhi Police, Delhi Jal Board, Fire Department, Railways, MCD and the Health Department were present at the meeting. Steps would be taken expeditiously to get things in place by November 20, the minister said.